Bubba, it’s been a few days since we said goodbye. This Mastiff goodbye has been difficult……as they all are. This goodbye has been different because of your very clear declaration and will to continue with me here in this lifetime despite your pain & my unwillingness to let you go. I had to make the decision on your behalf to help you with the final transition and it broke my heart. You are my Soulmate. You are so very brave and courageous. 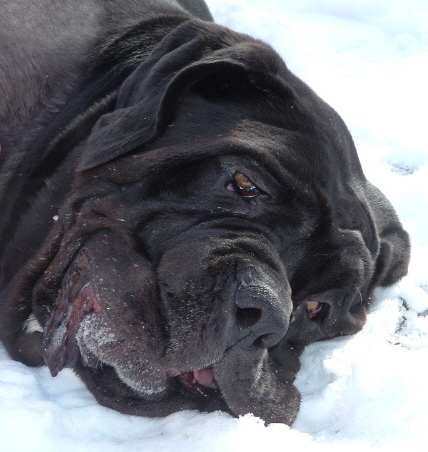 You are my child, my son, my beautiful Mastino Napoletano, my “Benno”, forever my Guardian and Protector. You joined us April 30, 2003, without a name and with an elbow that was riddled with pain. You didn’t have any Vet care for a mauled forelimb and somehow you survived. When I met you, you didn’t trust humans, you were terrified and unable to exit the car. It took three days of me feeding you in the back of the Suburban, growling, snapping and finally you allowed me to pet your head and help you out of the car. Slowly, we became such friends, our eyes talked to each other, and we started a five year journey together. You taught me courage, bravery, patience and unconditional love. Your right elbow fractured in November, 2004, it was a very bad fracture. Multiple attempts were made to repair it and finally an amputation. We tried an amputation leaving part of your “arm” so that I could perhaps trial prosthesis. I searched the nation for the expertise to fabricate such a device and the technology was simply not there due to your other problems not the least was hip dysplasia and your other elbow wasn’t very good either. You allowed me to treat the wound that developed on your “stump” and we thought we had it licked, almost figuring out how to cast it and perhaps the technology finally for a prosthetic device. Unfortunately, your “stump” became infected, so badly it threatened your life. Dr. Pelsue then did a full amputation and you remained three legged. You were quite functional and with Dr. Pelsue’s help, we were able to keep pain well managed. Ultimately, the ligaments holding your remaining “arm” gave way and once again you had to make an adaptation as did I. I learned how to help you mobilize using a front end harness. We made a miraculous trip to Montana in 2006 and had a custom cart fabricated for you, although you never did like the cart and we worked so well together as a team, we learned how to communicate with each other and move together, the relationship that continued to develop was phenomenal and very special. You loved rides in the van, sticking that beautiful big Neo head out of the window, you tore up all the seats in the van, and you were such a rascal. You also became a one person dog and my ultimate Protector. Your Dad was so patient with you knowing how much I loved you, how much he tolerated sometimes not being able to come into our space or move freely when you were with me. Your Dad took special delight (as well as some of our Staff) in being used as “bait” to get you to move from one room to another when you were in a stubborn mood. Your Dad’s favorite story that he loves to tell, being an Irishman, is about you riding in the back of the Jeep with me. A very nasty man harassed me following me along the streets on his motorcycle until we reached a stop light at which time he attempted to reach into the Jeep to grab me. You came flying from the back of the Jeep on your remaining 3 legs barking, teeth slashing and knocked the nasty man and his motorcycle to the ground! Your Dad was very proud of you that day for protecting me, my forever Angel. The love between us continued to grow as did our communication and language. The special bond that develops is similar to what mothers must experience with special needs children. There is nothing in this world that could possibly replace the years we had together and the special bond we shared. The daily care that you needed, I would do all over again if only I could have kept your other forelimb in tact. Unfortunately, in the final analysis, although Dr. Pelsue, was able to effectively manage your pain until very recently, we were facing a potential catastrophe with your remaining “arm”. The pain was evident and it was getting very difficult for you to move more than 20 ft. and for the first time, you didn’t want my help, it seemed to cause you more pain. Your eyes told me that you wanted to remain with me and you were willing to endure the pain. It broke my heart to see the pain and with the support of my wonderful husband, your Dad, I made the decision that I believed to be in your best interest, to end your life here on earth. We lost your Mother, Kona Bear, last November and you missed her so very much. Fortunately, even as you were worsening and although I questioned my decision, I obtained another female Neo and successfully integrated Jeruska into your life very quickly. She was the perfect match for you and in your brief time together, you developed a bond with her and her with you. She now searches room to room looking for you since you left us. She must have somehow filled the void that was left when we lost Kona Bear. I’m so glad now that I made that decision as she filled your life with joy in your last weeks. She has helped me in my grief, shared my grief. We miss you so very much. There will never be another Neo who takes your place; you will always be number one Mastino Napoletano. I’m sure there will be others just like Jeruska who will capture my heart, however, you my Love, will always hold that special place as my constant Companion and Soulmate. As I sit here and write this to you, the doors are open, the night time desert wind is gently blowing and I’ve ask Honey Bear, Sugar Bear, Greta, Molly, Maggie, Homer, Buster, Sammy, Lady and Charlie to help you with your transition and to provide you the support you will need on the other side. I’m sure you are four legged once again, a whole Neo, romping and pain free. I know I can still feel your aura, lingering. I know you had a talk with Jeruska telling her that it was her turn to care for me, to protect and love me and so far she is doing her job. I miss you and love you so much…………..I told you that so many times, brushed you, scratched and preened you because you couldn’t complete that job on your own and as I did, I would look into your amber eyes and tell you how much I loved you………..soooooooo much; so many precious moments like that. I’m in an unexpected comfort zone because we had so many one on one shared moments, that non-verbal language, so much love between us, so many memories, so many vivid pictures and videos with sound, the all so familiar barking, “talking” communication that I shall cherish forever lingers and surrounds me. Miss you baby and shake that tail feather on the other side.